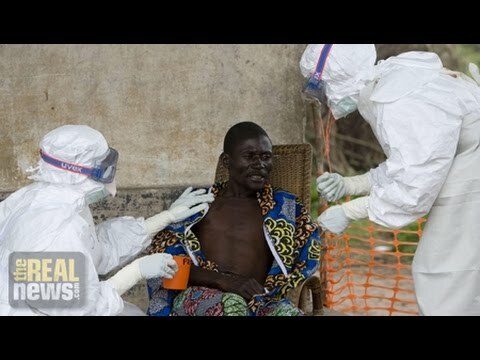 We’re picking up our conversation about the ebola outbreak, which is spreading in the west African countries of Liberia, Sierra Leone, Guinea, and now reports are showing that it’s spread it to Nigeria. There’s no proven treatment or vaccine for ebola, but an experimental serum known as ZMapp is being used to used to treat two American health care workers who were infected. Now joining us from New York to deconstruct these issues once again is Harriet Washington. Harriet is a medical ethicist and the author of the book Medical Apartheid: The Dark History of Medical Experimentation on Black Americans from Colonial Times to the Present. She’s also the author of another book, Deadly Monopolies: The Shocking Corporate Takeover of Life Itself–and the Consequences for Your Health and Our Medical Future. DESVARIEUX: Thanks for joining us, Harriet. HARRIET A. WASHINGTON, AUTHOR, MEDICAL APARTHEID: Thank you, Jessica, for having me. DESVARIEUX: So let’s pick up the conversation where we left off. And I want to get your reaction to what the UN Office for the Coordination of Humanitarian Affairs is saying. They’re saying essentially that one of the major reasons for the spread of ebola is that many people are not going to doctors because there’s a level of distrust of the Western medical community. Harriet, can you just give us a brief historical overview of Western medical experimentation in Africa? And how is this contributing to this distrust? WASHINGTON: Well, first thing I want to point out is that there is one doctor in Africa for every hundred doctors in the U.S.. So there are not that many doctors to go to. The history of medical experimentation by the West in Africa is a deeply troubled one. There are many, many incidents that would give rise to a logical fear of the health care system. I’m not saying it’s accurate, because I’m quite sure the doctors in the ebola crisis have nothing in mind except for the health and welfare of their patients. But this does not mean that the people who are avoiding health care are at all paranoid or gullible. They have real factual reasons for being afraid of this system. For example, one of the things I read quite frequently is that many people in different African countries have been avoiding polio vaccine injections, and therefore polio has begun to spread. This is a real tragedy. Yet these fears are often cast as they believe in ridiculous things, they think that the polio vaccines are actually sterilization agents in disguise. Well, that sounds quite absurd and paranoid until you realize that during the apartheid era, Dr. Wouter Basson headed Project Coast–one of its stated goals was to devise a sterilization agent that would work only in blacks and that could be hidden. WASHINGTON: And so this is common knowledge. It was reported quite widely throughout Africa, and to a lesser extent in Great Britain. Doctor Basson went on trial for murder. He was not convicted. But a lot of the people who worked for him described exactly this experiment. So this was something that was actually ongoing. So when I hear someone say, I’m afraid of a polio vaccine injection, it might be a sterilization agent, I don’t think that they’re being foolish at all. I think they have a legitimate fear. And there are many, many other cases. For example, one Scottish doctor, Richard McGowan, actually went to jail after being convicted of killing two patients. There were five patients whose murder he was initially accused of. He actually ended up going to jail. These were black patients. And he was accused of using his patients in a scheme to–under the guise of testing anesthetics, he was giving overdoses of anesthetics. That was the accusation. DESVARIEUX: Which country did this take place in? WASHINGTON: Zimbabwe. And it was a highly polarized discussion, with black people coming down on the side of this man is a serial killer with a doctor’s license, white people often coming down on the side of, oh, he’s a medical professional and you guys are simply paranoid. Yet in this country he was indeed convicted and jailed. Others were not convicted and jailed. One of them was Michael Swango. Michael Swango was accused of killing 16 people when he lived in–I think it was Zaire, and Zambia. When he lived there, in these African countries, patients were mysteriously dying. They had been poisoned. When he left, the deaths stopped. He wasn’t brought on trial. He left Africa before he could be brought on trial. But when he got back to the States, he was put on trial for the deaths of patients here in the states, and he ended up being convicted. So again there is a sense that we have another white Western doctor who has been killing Africans under the guise of medical treatment who has gotten off. There are many other cases. I think that probably one of the ones that bothered me the most was a man named Werner Bezwoda, who practiced at Wits University. This guy, he took black women with breast cancer and he claimed he had devised a treatment, which he tested on them–high doses of chemotherapy. Now, these high doses of chemotherapy were obviously going to cause many, many problems. Even a controlled dose of chemotherapy causes an assortment of medical problems. And these women died horribly, horrible deaths. Not only did these women die, but this man published articles in which he lied. He claimed that the high dose of chemotherapy had saved the women’s lives. Based on that, doctors in the West began treating their breast cancer patients who had no other options with high doses of chemotherapy. They also died horribly, horrible deaths. And by the time they realized that this report was false and had gone to Africa to check his books and discover that he had lied, not only black women but many white women had died because of this man. And it turns out that these black women who he gave these high doses to had never been told that they were in an experiment. They thought they were getting conventional treatment, which is too often the case with African experiments. I could go on. Thalidomide was tested in Brazil among people who have no history of thalidomide use, so they did not know that it gives birth to children phocomelia–with dramatic, dramatic, dramatic birth defects. And if you’re old enough, you can remember that in the ’50s and ’60s there were these pictures of children who were born missing limbs. And it was because of thalidomide. Well, in Brazil now, reports are surfacing of children being born with these missing limbs. And I looked at some of the promotional materials for this drug, thalidomide and some of its analogs, and one actually said that it was without side effects. So again in the developing world there are people who are not only being told they’re not in experiments, but they are being lied to about a lack of side effects. When you have this sort of history of exploitation, it’s not fair to dismiss these fears out of hand as if they were somehow paranoid. When people focus on the fears of Africans, they are making a mistake, because that’s only one side of the equation. Other side of the equation is the untrustworthiness of the health care system. When you have a health care system that fails to protect research subjects, fails to protect patients, then that’s a large part of the problem. And that also has to be scrutinized, and we have to repair that as well. DESVARIEUX: I’m so glad you mention this, because I find that in the Western media, the mainstream press, they do describe this fear, but you really laid out what it’s grounded on. And I want to get your take on how the mainstream media has been handling this story. What do you think they’ve gotten wrong in their portrayal of this virus? WASHINGTON: What they’ve gotten wrong is what I’ve just said, first of all, the focus on African fears rather than on a medical system that has tended to fail Africans. Also what they’ve gotten wrong reflects a basic misunderstanding of how drugs are tested. By law, by federal law under the Code of Federal Regulations, one has to test a drug in an animal before it’s given to humans. And yet the accounts often say we shouldn’t give Africans the drug because it’s never been–it’s only been given to animals, and they’d be the first to be given a drug that’s never been tested in humans before. Well, first of all, that’s wrong. They would not be the first. The first were the two health care workers that were brought back to the West. And second, that’s a nonsensical concern, because it’s true of every drug. Virtually every drug is given to some human group after being tested in animals. Someone’s always first. The real question is: will the tests be conducted ethically? Not whether they should get them. A cynic might say that these concerns only seem to surface with a drug that is only going to address an African concern, but I’ll choose not to be a cynic and say that that’s a real but misguided concern. One of the other things that arises that really bothers me is this discussion of cost. I think I’ve already addressed how people worry about how much, how high the price tag will be–Africans can’t afford it. Well, considering the fact that people in the third world make two out of five clinical trials possible and do so at very cheap rates, I say that we owe them. We’ve got a tab running. And we certainly need to pay what needs to be paid to make this drug possible. So I think that’s really a misguided concern. The concern, too, is that of the people who need this drug, we should not immediately assume that health care workers should be the first ones to get it. Health care workers should certainly get it, but they should not get it at the expense of Africans who are at risk of the disease. DESVARIEUX: Alright. Harriet Washington, joining us from New York. WASHINGTON: Been my pleasure. Thank you for having me. Harriet A. Washington is a medical ethicist and the author of Medical Apartheid: The Dark History of Medical Experimentation on Black Americans from Colonial Times to the Present and Deadly Monopolies: The Shocking Corporate Takeover of Life Itself – And the Consequences for Your Health and Our Medical Future.